I'm sure a good few of you have been waiting in anticipation of the new series of Game of Thrones. I was lucky enough to get to see the first episode of season 5 at a special screening by Belfast Film Festival. I can tell you its a great season opener, opens up a lot of new story lines and teases us for future events. Now, as I'm sure you're also aware, the first four episodes have been leaked. I've decided NOT to watch them since I don't think I can wait another four weeks for the next installments but I fear getting spoiled, it's a double edged sword I think. 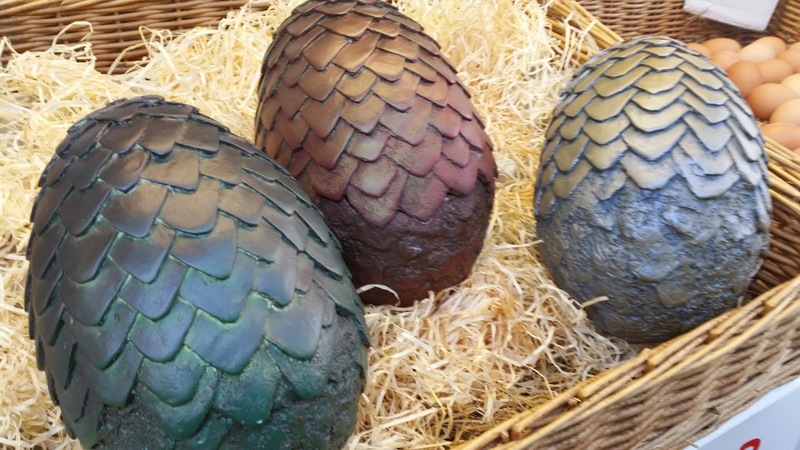 Any way, moving onto the nail art, in the first episode we get to see Dany's dragons again and I was also inspired by a publicity stunt pulled in Belfast this week so come on under the cut to check out my talons! I'm so glad I've finally had the chance to use my Binky London Venom shade. I couldn't imagine any other manicure being more appropriate for this duochrome shade than dragon egg nails (well maybe snake nails but whatever). Anyway, this polish shifts from green to brown which you can't really see in pictures but it's a gorgeous effect in person. So this past Friday, at St George's Market, there was a very peculiar sight. If you follow me on Instagram you would have already seen this but here's what awaiting eager shoppers before 12pm. 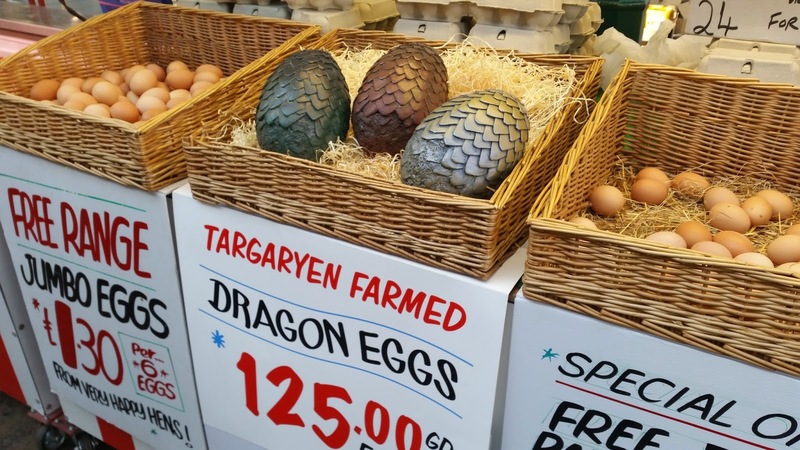 The eggs actually vibrated in the basket and people walking past were bewildered and having to explain it to multiple people was a bit funny LOL but you could have walked away with a Targaryen farmed Dragon egg for the princely sum of 125 Golden coins! 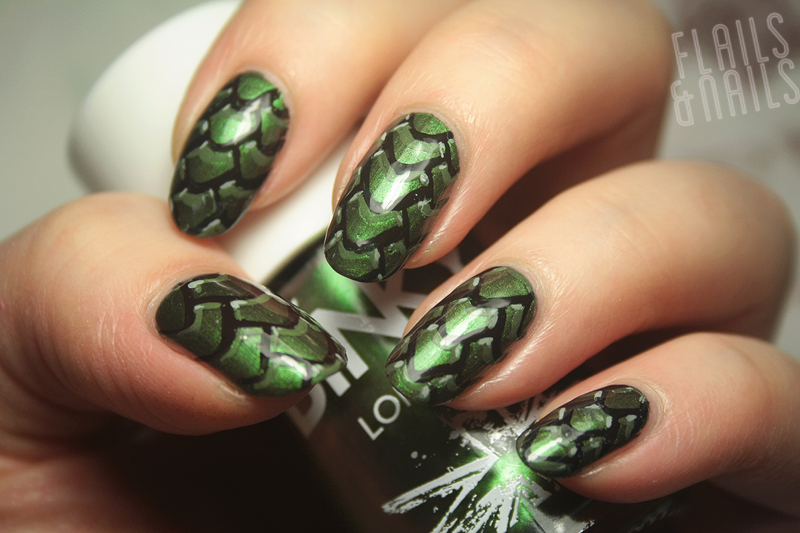 To achieve this look, I applied two coats of Venom and sealed them with a layer of fast dry top coat. Then using my detailing brush, I used Partybruise to draw the outlines of the dragon scales. I tried to replicate the pattern of the eggs with varying success across my nails LOL. I added a bit of white to venom to create a slightly lighter shade for the more subtle highlights across the tops of the scales and added more white for the highlights on the outer corners. I used the same brush for all of the detailing so it wasn't overly complicated in terms of tools but it was a bit time consuming because of all the highlighting work but the end effect I think is quite cool. 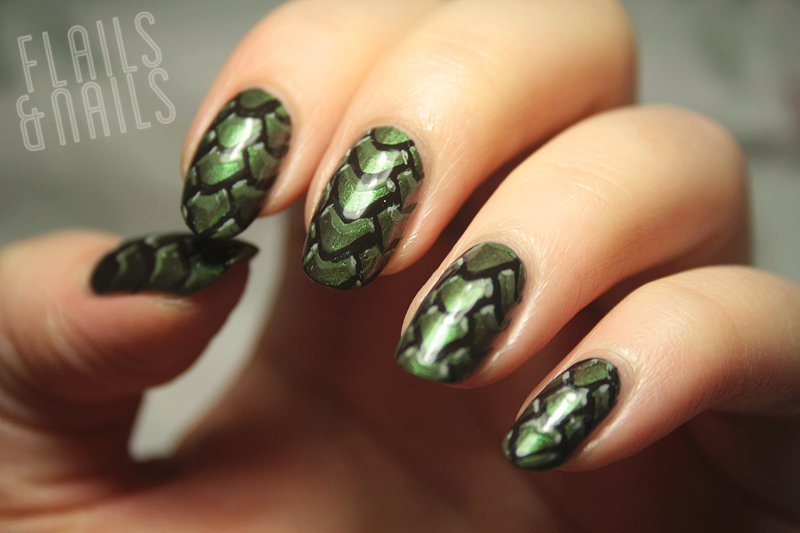 So there you have it, my first Game of Thrones nail art of the new series. If you're a fan of the show and haven't seen my past GoT posts, use the tab at the top of the page. I hope during the series I will post new GoT nails every other week to coincide with new episodes (I'll be alternating between GoT and Orphan Black) so any suggestions on what you'd like to see are more than welcome.